Baru (right) symbolically signs on the handing over plaque for the new classroom block at SK Ulu Sungai Salim, while Dayun (third right) and others look on. 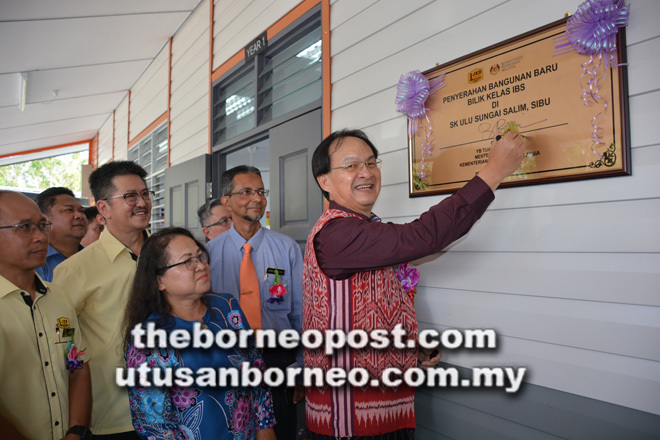 SIBU: A total of 48 dilapidated schools in Sarawak have been rebuilt using Industrialised Building System (IBS), while another two will be completed towards middle of this month, says Works Minister Baru Bian. He added that rebuilding of dilapidated schools in the state, which is implemented by Public Works Department (JKR) Malaysia involved 50 schools with the total cost of RM138,458,260. In Sabah, the implementation by JKR Malaysia involved 37 dilapidated schools with project cost of RM163,441,400.00. “In Sarawak, the scope for phase one of the project involved building 50 schools using 13 packages and 13 contractors. On schools in Sabah, he said the project scope for phase one, involved building of 37 schools with 12 packages and 12 contractors. The overall project scope comprises 277 classrooms, 37 science rooms and 42 toilet blocks. Baru was speaking during his visit to SK Ulu Sungai Salim here yesterday to inspect the rebuilding and upgrading of dilapidated school project using IBS for Sarawak (phase one) implemented by JKR Malaysia. Baru added that for SK Ulu Sungai Salim, the project (the classroom block) was completed on June 27 and handed over to the state Education Department on July 31. Earlier, he said there are nearly 2,000 dilapidated schools nationwide with leaking roofs, damaged floors and walls as well as old equipment that have not been replaced. He disclosed that for the implementation of phase one in Peninsula, JKR Malaysia had been appointed as the implementing agency with the schools numbering 158 in 12 states. Baru said overall, there are 38 packages costing a total of RM245 million. He added that implementation of phase one of dilapidated schools in Sarawak and Sabah is carried out by two government agencies, namely Ministry of Education (MOE) and JKR Malaysia with each given allocation by the government separately. “Implementation of dilapidated schools in Sarawak that is implemented by MOE itself – involved 66 schools with project cost of RM278,118,000.00 agreed by the government. He also said JKR Malaysia as the programme manager has prepared the drawing design standard to be used by JKR Sabah and JKR Sarawak appointed as the implementing agency in dilapidated schools building projects. JKR Sabah and JKR Sarawak had inspected schools to identify the scope as well as related works. He hoped that more contractors would emulate Cekaplex Sdn Bhd to build dilapidated schools within the stipulated time frame. Baru also noted of some requests made the SK Ulu Sungai Salim headmistress Dayun Jackson Bunsie on inadequacy of school buildings, who highlighted the need for administration and science blocks, library room and multi-purpose hall. The school has 110 pupils with 12 teachers and three support staff. Also present at the function were JKR Malaysia headquarters (Works Education Branch) director Ahmad Redza Ghulam Rasool and JKR Sarawak deputy director (building and expertise) Stanley Chai.